SIRVA “Shoulder Injury Related to Vaccine Administration” is compensated through the National Vaccine Injury Compensation Program (“VICP”) which is administered through the United States Court of Federal Claims in Washington, D.C. Through the VICP, persons who have been injured by vaccines covered under the program can make a claim for compensation. Since 1988, over 20,000 petitions have been filed with the VICP. Over that same time period, 17,536 claims or petitions have been adjudicated. The total compensation paid over the life of the VICP is approximately $4B dollars. The VICP is funded by a $0.75 excise tax on vaccines recommended by the CDC. Improper vaccine administration in which the injection is given too high in the upper arm can cause shoulder injuries such as bursitis and tendinitis. According to the CDC Advisory Committee on Immunization Practices dated October 25, 2017, shoulder injury related to vaccine administration manifests in shoulder pain and limited range of motion occurring after the administration of a vaccine intended for intermuscular administration in the upper arm. 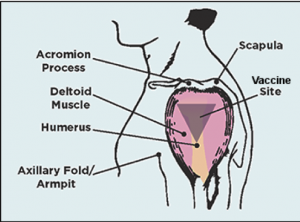 These symptoms are thought to occur as a result of unintended injection of vaccine antigen or trauma from the needle into and around the underlying bursa of the shoulder resulting in an inflammatory reaction. By definition, SIRVA is caused by an injury to the muscular skeletal structures of the shoulder but is not a neurological injury. A recent NBC News article reported that half of all new federal vaccine injury cases that allege shoulder injury “have little or nothing to do with what was in the syringe,” a fact that was confirmed reluctantly, by the U.S. Department of Health and Human Services. The U.S. Department of Health and Human Services doesn’t track or monitor how often SIRVA cases occur. A review by NBC News found that the VICP has paid 575 SIRVA patients more than 75 million dollars in compensation while doing little to nothing to fight this preventable problem. In response to the rise in SIRVA cases, the CDC has launched an educational campaign on the correct way to administer vaccinations. Further, the CDC advised it will work together with Health and Human Services to conduct a review of SIRVA claims which they are hoping to complete by the end of 2019. As it stands now, SIRVA injuries are clearly on the rise. Thankfully, those who have received a shoulder injury from a vaccine can petition for compensation under the VICP. Hopefully the additional studies underway by the federal government can aid in determining why these injuries occur and have been increasing, as well as provide better training to practitioners to help prevent these injuries in the future. Jodie Fleischer et al., Half of All New Federal Vaccine Cases Allege Injury From Shots Given Incorrectly, NEWS 4 I-TEAM (May 2, 2018), https://www.nbcwashington.com/investigations/Half-of-All-New-Federal-Vaccine-Injury-Cases-Allege-Shots-Given-Incorrectly-481441201.html. See Health Resources and Services Administration, National Vaccine Injury Compensation Program Data Report (2019), available at https://www.hrsa.gov/vaccine-compensation/data/index.html. Fleischer et al., supra note 1. See U.S. Dept. of Health and Human Services, Centers for Disease Control and Prevention, Advisory Committee on Immunization Practices, Summary Report (2017), available at https://www.cdc.gov/vaccines/acip/meetings/downloads/min-archive/min-2017-02.pdf.